Is this an FJ? reminds me of this model Holden anyway! This ad, along with a few others, came from Australia in 2005. As it had been clipped from an old newspaper, I've no idea when this was printed. I'd guess early 1950s judging by the references to improvements made since 1949. 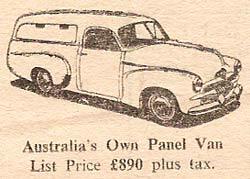 The Holden Utility, or ute in Australian parlance, is the main focus of this advertisement, although the £890 (plus tax) Panel Van gets a mention too. I hadn't realised that Australia was using UK currency back in the 50s!! This ad was put together by Mollison Motors, of 167 Mollison Street, Kyneton. Holdens are part of the General Motors empire, and share many of their mechanical parts. I've always been a fan of classic pickups, and the Australian utes, with their curved rear cabs (British pickups usually have flatter backs to the cab) are some of the most stylish I think. The idea was to combine most of the comfort of a saloon car, with the bonus of the carrying capacity of a working truck. Utilities took off in a big way in the 1930s, and have continued to be very popular ever since. 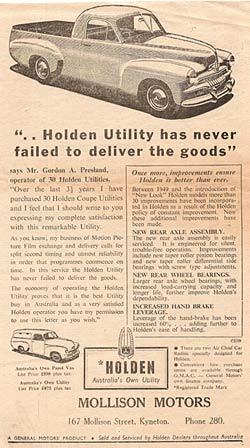 ".. Holden Utility has never failed to deliver the goods"
The above quote was made by a Mr. Presland, who operated 30 of these curvy utilities ..
"Over the last 3.5 years I have purchased 30 Holden Coupe Utilities and I feel that I should write to you expressing my complete satisfaction with this remarkable Utility. As you know, my business of Motion Picture Film exchange and delivery calls for split second timing and utmost reliability in order that programmes commence on time. In this service the Holden Utility has never failed to deliver the goods. The economy of operating the Holden Utility proves that it is the best Utility buy in Australia and as a very satisfied Holden operator you have my permission to use this letter as you wish." The Panel Van came in at £890, and the Coupe Ute a little less at £875 (both plus tax). We're told that since the 'new look' models came out in 1949, over 30 improvements have been made to the design. A new design of rear axle had been recently introduced, along with more robust rear wheel bearings and, wait for it, an increase in hand-brake leverage of 60%. For the outback farmer who liked to whistle while he drove, there was the option to buy one of the Air Chief Car Radios that were available. A Hire Purchase scheme was also available, if you wanted to spread the purchase cost of your new Holden. If anyone has photos of surviving Utes, I'd happily feature them on this page. My own ute purchases, bought in 2006, can be seen on my Bedford PC page.